4 miles North East of Mattishall at Frans Green are the remains of some World War II air fields. Its hard to imagine how it must have been during those dark and troubled times. The landing strips have now all been swallowed up by farming and local businesses. Chicken and turkey sheds now cover must of them and the hangers are now barns or out-houses. Long gone are the sounds of a military presence. 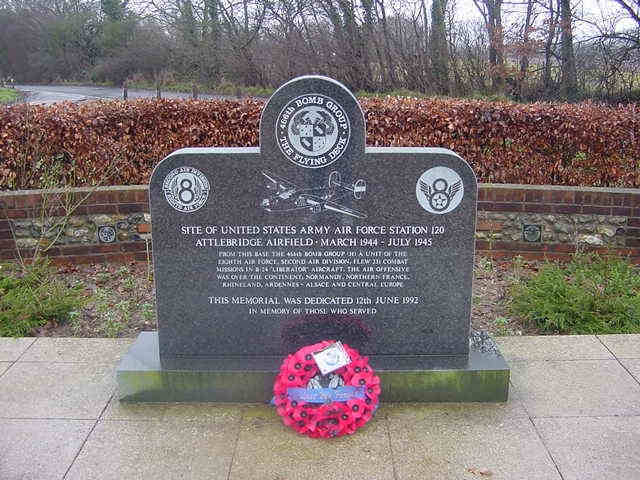 This was the home of the United States of America 466th Bomber Group although recorded as 'stationed at Attlebridge'. Below is a photo of the Memorial dedicated to those of the USAAF 466th Bomber Command who served there. RHINELAND, ARDENNES-ALSACE AND CENTRAL EUROPE. This site opened as a grass field satellite of Swanton Morley in June 1941. It has been the base and home to many Squadrons both British and American, the first being the 88 Squadron who flew their Blenheims on their first mission in August 1941 aiding 2 Group from Swanton Morley in their anti-shipping campaign. They flew their last Blenheim operation on October 26th 1941 with very low level flying on a 4,000-ton motor vessel with four other merchant ships guarded by three flak ships off the Hague. The Blenheims were replaced by Bostons in November 1941. The Bostons were out most days, usually fighter-escorted during Circus operations, attacking Continental targets. In suitable weather the 88 Squadron mounted some fast, low-level attacks on power stations. In August they took part in the Dieppe raid. On September 30th 1942 they moved to Oulton. They were moved because the Americans were coming. They arrived in September 1942 when the 319th Bomb Group moved in with the Martin Marauder in early form. They left in November amid great secrecy. Runway laying carried on to bring the airfield to full station status. An aerial view of the air-field, known as Attlebridge, between Frans Green and Western Longville. In march 1943 2 Group was further expanding. 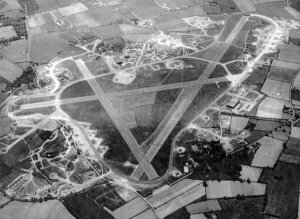 New squadrons had to be accommodated as RAF and USAAF clambered for airfields. No 320 Royal Netherlands Navy Squadron was the next to occupy the base this time with the North American Mitchell. Despite their wish to employ Mitchells on low-level work the aeroplane was unsuitable. In May 320 Squadron was ordered to stop low flying over Norfolk where B-24s needed to practice for the Ploesti raid. In June 1943 the 320 Squadron undertook to fly some deep air-sea rescue sweeps. On August 17 1943 they flew their first bombing mission attacking marshaling yards at Calais. On the 19th they bombed Poix airfield and on the 20th came the Flushing raid. They moved out on the 2nd September to Dunsford to be closer to their scene of action. The airfield laid quiet again, closed for massive extension and modification. Typhoons of the 247 Squadron had briefly used the station in August 1943. The Americans returned and in March 1994 B-24Hs of the 466th Bomb Group arrived. The work-up was rapid, the need urgent, and on the their first raid on March 22 1944 they went to Berlin. It was the longest initial assault ever flown by any unit in the history of the European Theatre and one of the heaviest bombardments on record of the German Capital. The morning of D-Day found them bombing gun emplacements on the Normandy shore. They aided the breakout from St Lô and when fuel was short in September 1944, ferried supplies to France. From March 22 to August 9, 1944 the group attacked 41 targets in Germany and 59 targets in occupied continental Europe. During this period the gunners were credited with destroying 25 enemy aircraft. The group flew 231 combat missions with 5,693 sorties, dropping nearly 13,000 tons of bombs. The total losses for the 466th Bomber Command from March 22, 1944 to April 25,1945 were, 333 Killed In Action, 171 Prisoners Of War, 8 evaded 27 interred. A special event took place on the afternoon of Friday August 18 a flight of B-24 Liberators, including a red and white zig-zag lead ship from the 466th Bomb Group collected Major Glenn Miller and the entire American Band of the AEF from RAF Airfield of Twinwood Farm just north of Bedford and after stopping of at Steeple Morden near Royston (where he gave a performance for the 355th Fighter Group and members of the 91st Bomb Group from nearby bomber base at Bassington) they loaded their instruments, music stands etc, on board the B-24s which flew them to their home base Attlebridge (actually sited between Frans Green and Western Longville). Glenn Miller and the band along with special guests Rudy Starita's Orchestra and Hollywood film star Col. James Stewart, performed in the Northern Hanger. Among the numbers played were 'In the Mood' and many other hits. This concert was a 100-mission party for officers and enlisted personnel and was attended by 10,000 from this base and others in the area. The band stayed overnight on the base and Glenn retired to the Officers Mess where he was asked by a Capt. John Woolnough if he could have his photograph taken with him to send to his brother who was a great fan of the band. So that there would be no other requests Glenn Miller agreed provided the picture could be taken somewhere out of the limelight. The only room they could fine unlocked was the toilet, its was reported that Miller was much amused by this and this turned out to be a unique picture of Miller and Woolnough taken by Sergeant Russell Clements.